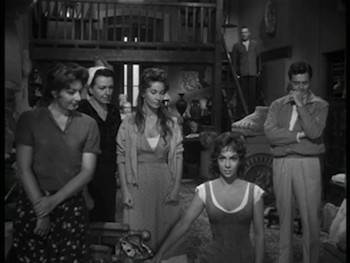 Jules Dassin's 1959 French-Italian co-production The Law (La Loi) is a flirty and fun tornado of small-town scandal. Set in the coastal village of Porto Manacore, looking out over the Adriatic Sea, the ex-pat director's adaptation of a Roger Vailland novel was apparently too hot for the censors upon its release, relegating it to obscurity amongst the filmmaker's resume. After spending two hours spinning in The Law's dizzying narrative, I can't understand how a revival took so long to come around. The Law is a story of how social structures are governed, showing us how life in the town is dictated by two men--the Godfather-like Don Cesare (Pierre Brasseur), who has all the political and financial power, and the gangster Matteo Brigante (Yves Montand, Z [review]), the muscle on the streets. 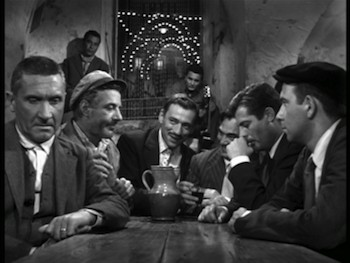 "The Law" is also a drinking game that was popular in Southern Italy, and its strange rules mimic the way everything else is run. One man is named the boss, and he appoints his deputy, and together they control the wine. They pour the drinks, choosing who gets a glass via posturing and humiliation, until the pitcher is empty. Then a new boss is chosen, and a new deputy. You keep going until the players can't stand it anymore. Such is life. You keep going until you can't stand it anymore. The heroine of The Law is Marietta (legendary Italian beauty Gina Lollobrigida). Marietta and her mother and two sisters live with Don Cesare, and are essentially his harem. He currently sleeps with her older sister, but Marietta is next to be called into his bed when he grows bored with her sibling--just as it was with their mother and her eldest daughter before them. Marietta's brother-in-law, the Don's right-hand man Tonio (Paolo Stoppa), also lusts after Marietta, and Brigante is determined to make her his own. She has other ideas, however, and when a new fellow comes to town, Marietta sets her sights on him. 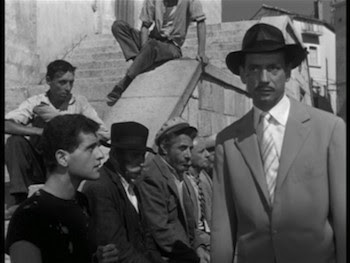 Enrico (Marcello Mastroianni, 8 1/2 [review]) is an agronomist sent to Porto Manacore to modernize it. He represents progress, and so naturally butts heads with Don Cesare. When you own all the land, you don't want to be told what to do with it, after all. Enrico is overwhelmed by the convoluted social structure, and when he tries to play "The Law," it's not to his liking. On the other hand, Marietta very much is to his liking, even if he can't figure out how to make it work. She's a practical gal and ready to marry the outsider, she just needs to find a dowry. When she sees a Swiss tourist with a fat wallet, she lifts it. Half-a-million lire should be enough for any wedding. By no coincidence, she also gets a neighborhood boy--part of a gang of thieves and pranksters that do her bidding--to steal Brigante's knife. It's his only weapon, and the sharp blade scares everyone else. You don't have to have Freud on retainer to get the symbolism of Marietta taking it from him. If all of this sounds particularly tangled, well, hold up, I'm just getting started. The Law is packed front to back with subplots and narrative complications. For instance, Brigante's son Francesco (Raf Mattioli) is having an affair with the wife of the town judge (Teddy Bilis). The woman, Lucrezia (Melina Mercouri, Dassin's real-life spouse and star of his films Never on Sunday and Topkapi), enlists another lady, Giuseppina (Lidia Alfonsi), to help her pass notes to Francesco. Giuseppina knows what Lucrezia is going through, as she's the mistress of the chief of police (Vittorio Caprioli). Also, Lucrezia bribes her by buying her a dress that is supposed to lift her breasts so she appears to have a bust like Marilyn Monroe's. When we first meet Giuseppina, it's while the cop is telling his buxom wife that he dreamt that her flat-chested friend had a bosom herself--which should tell you something about how sexed-up The Law is. Gina Lollobrigida's cleavage is an element of real focus amongst her neighbors, and I'm starting to understand why my dad thought it was such a big deal when she guest-starred on Falcon Crest when I was 12 years old. Va-va-voom! Jules Dassin's script for The Law is an extremely agile piece of writing. He never gets overburdened by all this story, nor does he ever shy away from the heat. Visually, he and cinematographer Otello Martelli (La strada [review]) make use of the tall buildings and winding streets of Porto Manacore to give the audience the feeling of traveling through a maze. Built on a hillside, the village has lots of stairs and many levels, and it's easy to get lost. Try to map out which way Marietta is going as you watch The Law and see if you can keep up. The way the town is built, and how it's put to use on film, is another representation of its class structure. One of the earliest scenes is an impressive tracking shot that takes us up to the top of the police building, peering into the apartments where the judge and the chief live, moving down the side of the building and across, past the jail cells. The camera is being dragged along by Marietta's siren song, and we find her across town, shining boots on a balcony and singing to the morning sky. The men of the movie are bewitched, and so are we. The Law is a real narrative tour-de-force, full of rich characters and surprising script developments. The actors all attack their roles with relish, and Dassin was at the height of his powers when constructing his mis-en-scene. The Law is as fresh and bold as any modern bendy, curvy crime movie, while also not being a crime movie at all. What a fantastic discovery!